Rambi is a giant rhinoceros, so they presumably put a delay on his jump to make him feel heavy. Be aware of that while practicing, as it makes the first half of this level much more difficult. Pay attention to where wiggling (fast left-rights) is used to safely pass through the spinning mincers. For the jumps over the mincers starting at :16, hold B after hitting the first gnawty until you get over the double mincers. At :28, you have to do a precise jump through three moving mincers. Pause the video to find a visual cue; you can use either the dip in the ground or one of the stalagmites in the first background layer. 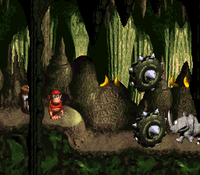 You can use the bananas after the spinning mincers as a cue to land on the first moving platform. For the second one, make sure you jump on the edge of the platform so that the damage boost will carry you to other side. Too early and you will plummet. This page was last edited on 12 March 2019, at 18:04.